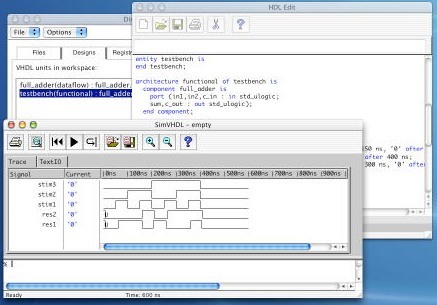 The only VHDL simulator available for Mac OS X! 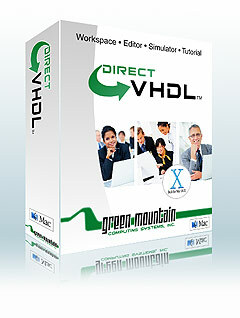 DirectVHDL is a low-cost, interactive VHDL simulator that is perfect for learning or personal use. DirectVHDL is built around a VHDL interpreter that allows you to edit and simulate your VHDL design without complicated setup or compilation procedures. DirectVHDL simply loads and simulates in one step. Mac OS X 10.5, 16 MB hard disk space. Mac OS X 10.2, 10.3, or 10.4, 16 MB hard disk space. For Mac OS X 10.2 only, TclTkAqua (free download) is required. See DirectVHDL for Windows page.